An infamous piece of legislation still looms in Uganda – the “Kill the Gays” bill, which would punish homosexuality with the death penalty. 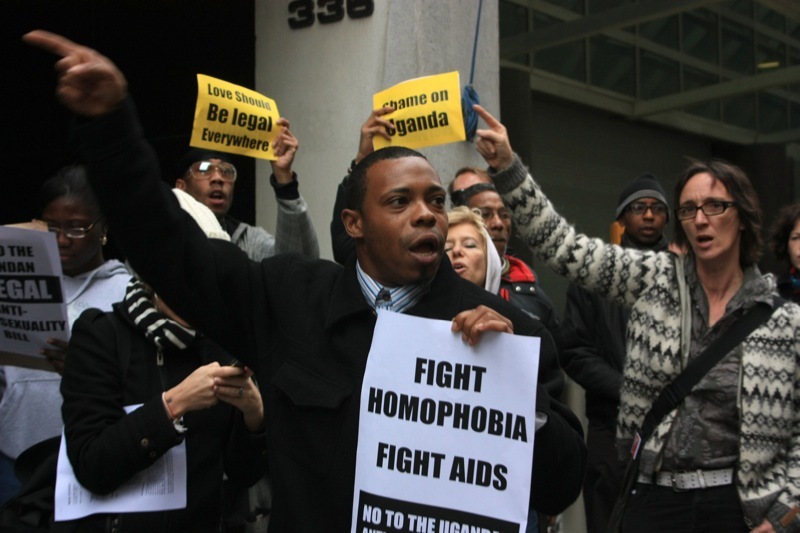 Homosexuality is already illegal in Uganda, but that law is rarely if ever enforced. Ugandan public sentiment on sexuality ranges across all corners of the spectrum. So if there’s already a law in place, and if the people don’t agree even on whether or not it’s wrong to be gay, why would Uganda even consider this bill? Last week I had the honor of interviewing Beau Hopkins, the playwright of The River and the Mountain, which is the first Ugandan play to deal with homosexuality. Hopkins brought the show here to the DC/Baltimore area for a series of staged readings. The play was controversial in Uganda. It was the first time a main character said “I’m gay” on a Ugandan stage; and for that reason among others the Ugandan authorities tried to censor the show. When it went up anyway in fall of 2012, producer David Cecil was charged and later deported to the UK. I brought up the “Kill the Gays” bill with Hopkins and was surprised by his reaction. The bill has been whipped into a fury of popularity, not because people are all against homosexuality, but because they see gay rights advocacy – or at least how gay rights advocacy has been presented in Uganda – as a Western imposition. So what they’re reacting to is not homosexual rights. It’s the underlying narrative of neocolonialism, that the West is still trying to meddle and interfere in Africa. In the US, it’s considered noble to spread our concepts of human rights (however we define them) around the world. Our politicians hail us as a beacon for other nations, a shining light of hope for the marginalized and oppressed. But beacons don’t move. You see them at a distance and go to them willingly, happily. They don’t come to you and bomb you until you pay attention. The “capital” of which he speaks exists in Uganda because the West has done enough harm in Africa to cause a rejection of Western ideas – even the good ones. Bills that seem anti-American thus get a lot of traction. If we want to bring human rights to places like Uganda, it would appear we have to back out in other ways. The US military has supported the Ugandan government for years. Some Ugandans think those military boosts made the government more authoritarian at home against its own people and led directly to civilian casualties and human rights abuses. In addition, foreign groups like the US appear to use aid to vie for Ugandan oil and hold back Chinese expansion in Africa. It almost seems like we use Uganda as just another pawn on the grand chessboard. Is it any surprise, then, that freedoms we celebrate in the US don’t translate well to the Ugandan people? They might not think of “freedom” and “America” as going together at all. Perhaps it sounds terribly hypocritical to them when we demand they recognize our views of human rights, even as we affect their rights for the worse through our intervention. If we want to have any real say as a beacon, we have to “let our light shine,” not force it on other countries like a blinding strobe. May freedoms come to all people, gay or straight, in Uganda. And may it happen despite the rest of the world’s involvement. Never mind Uganda, I am British and I do not think America synonymous with Freedom and Right. It has some good ideas and trends, some monstrous ones. Always love your posts and find them fascinating! Had one question about this one. It’s definitely interesting to hear some Ugandans’ perspective of why gay rights is being rejected. I am interested in what the reality of US involvement and contribution to unrest is in Uganda. You say “It almost seems like we use Uganda as just another pawn on the grand chessboard”. Are we? I know this post focuses on Ugandan perception not the facts of US involvement, but then you say, “If we want to have any real say as a beacon, we have to “let our light shine,” not force it on other countries like a blinding strobe.” I totally agree but I’d be interested to know what we are actually doing vs. what we are perceived of doing. Just something that it would be interested to learn more about in future post for sure!